A Palestinian journalist shot by Israeli forces during clashes along the Gaza border has died, the health ministry in the Strip said Saturday. Yasser Murtaja, a photographer with the Gaza-based Ain Media agency, was hit during clashes Friday, the ministry said. 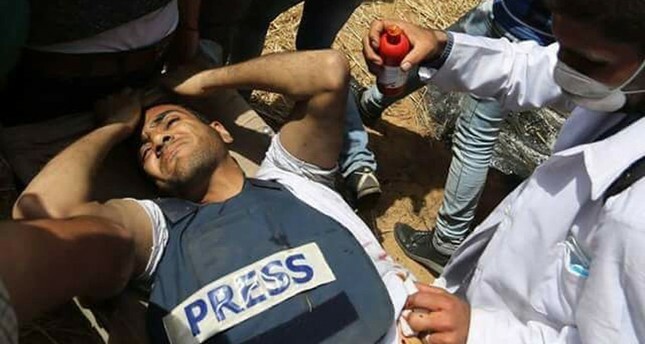 An AFP photograph taken after he was wounded showed Murtaja wearing a press vest as he received treatment. The Israeli army declined to comment, saying it was reviewing the incident. The Gaza health ministry also announced the death of another man, 20-year-old Hamza Abdel Aal, saying he was shot east of Al-Bureij in central Gaza. The deaths brought the number of Palestinians killed during Friday's clashes to nine after thousands gathered along the border for the second week in a row. Some Palestinians burned mounds of tyres and threw stones at Israeli soldiers over the border fence, who responded with tear gas and live fire. At least 491 Palestinians were injured by shooting, the health ministry said.